Wagyu. It’s probably the most desired kind of beef out there right now. Wagyu. Simply mentioning that word will make any gourmand’s mouth water. Wagyu. For meat eaters, just the mere mention of it will attract the meat eater’s attention. Wagyu. The beef itself demands a high price because the word means you’re going to eat quality. Why am I mentioning all of this? It’s because Wagyu is the type of beef they used in the last burger for Burger Month! As this is the last week for Burger Month for the year, I wanted it to be special. I wanted it to be not just your regular burger and something to close out the month with a bang. I was wracking my brain thinking of a local burger joint that served something rather unique, I just so happened to stumble upon a Wildflour branch. I’ve never actually eaten at Wildflour before. No real reason as to why not; I just never gotten around to doing so. Which is why it was strange why I decided to check out its menu. What a very nonchalant sign. No design or nothing. I looked if they served any burgers and they did. There was only one burger on the menu available at Wildflour: the California Burger. It’s a 1/3 pound beef patty topped with cheddar cheese, tomatoes and lettuce. There’s also a side of potato chips instead of fries. Oh, and they also give out a loaf of bread as an appetizer. But it certainly caught my attention. Why? Well, they apparently don’t use just any kind of beef for their burgers. No, they use the Wagyu beef in their burgers! I gotta try it now! I guess I do have to start out this review with the appetizer since it did come with the meal. 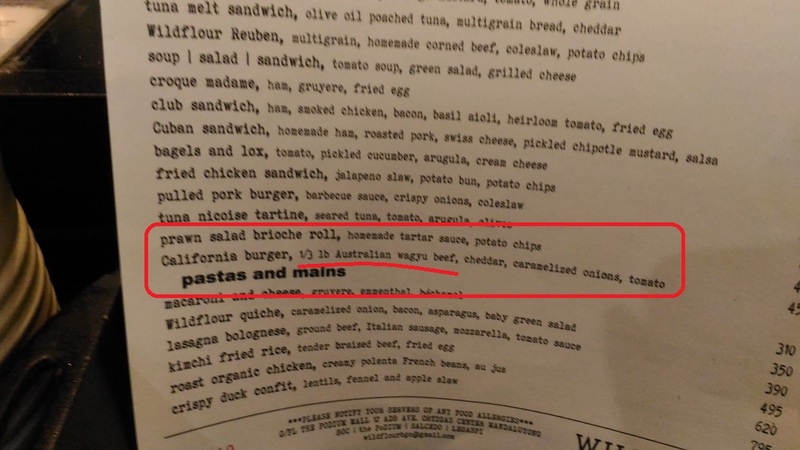 It would be unfair to just review the California Burger and potato chips and totally ignore the appetizer, wouldn’t it? Well, I will say that it was okay. I think it was a baguette with the ends cut off, which is good because no one likes getting the ends because it’s all crust. 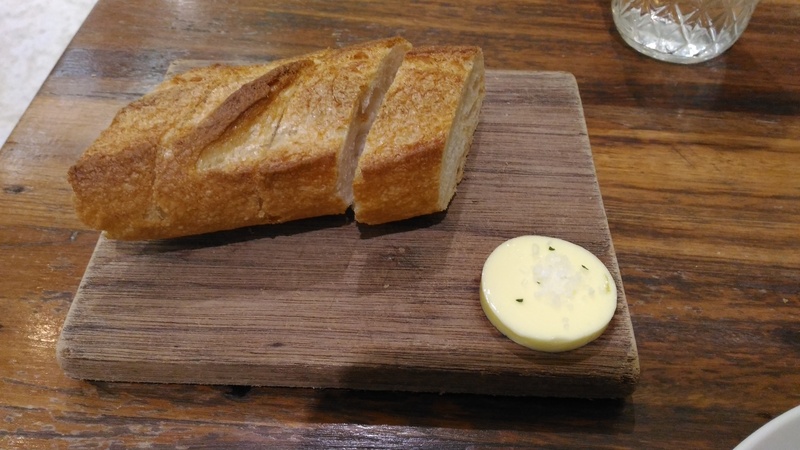 I do have to mention the nob of butter it came with because that was pretty good. The butter was unsalted but sprinkled with sea salt and, since the salt crystals were whole, they packed a punch! On a wood block, no less. But enough about the appetizer! 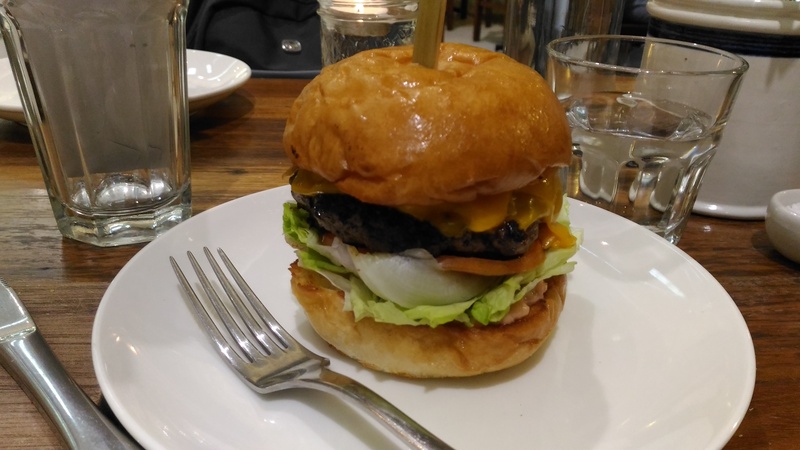 Let’s get to the meat (pun intended) of this review: Wildflour’s California Burger. When you do request for it, the server will ask you how you want your burger done. I incidentally asked for it to be medium done, just to be on the safe side. But as long as it isn’t well-done, it should be good. I really don’t understand why a lot of Filipinos ask for their meats to be well done. Don’t they know you’re essentially asking for the flavor of the meat to be cooked out? Anyway, what I want to say is always go for medium-rare or medium. That’s my Pro-Tip for the week. I’ll be honest, the California Burger wasn’t as big as I thought it was going to be. Since it’s allegedly 1/3 pound of Wagyu beef, I expected to be confronted with something much large. That’s not to say that it wasn’t big. But it did look surprisingly smaller than a Quarter Pounder from your friendly McDonald’s branch. However, it did look incredibly good. It looked really neat and clean as there wasn’t anything hanging out on the edges. As I picked up one of the halves, it started falling apart. It was weird because, while I was slicing into it, I felt it was a fairly solid burger. I think cutting it in half destroyed its structural integrity. The meat patty did hold remarkably well but the rest of the other stuff, like the lettuce and tomatoes, were attempting to slide out of the burger as I bit into it! The California Burger was deteriorating with each bite so I did what any rational person would do: eat it as fast as I could. It was worth it to see that beautiful pinkish hue inside! Devouring both halves was extremely satisfying, however, as Wildflour’s California Burger was incredibly good! Now, I’m not an expert and I don’t delude myself into thinking I know what Wagyu beef actually tastes like (I only had in once before eating the California Burger), but the beef patty was incredibly tender and juicy. There was also a very savory flavor in it that was just so damn good! A part of me wished that I didn’t have to eat it fast so I could actually savor the flavor. It certainly helped that the lettuce and tomatoes were fresh. I actually have to mention something about the tomatoes specifically. Occasionally, I’ve had burgers where you couldn’t bite into the tomatoes; if you did, they would slide off the burger. I don’t know how they did it but Wildflour managed to get tomatoes that actually could be bitten into without sliding out of the burger! Oh, and the cheese was melted just enough to be gooey but not too much so that it would be messy. Really good and satisfying burger. Is there a difference between Australian Wagyu and other kinds? The potato chips were initially disappointing for me. They were crispy and thin, alright. And they weren’t greasy at all. But I expected them to be salted to a degree. 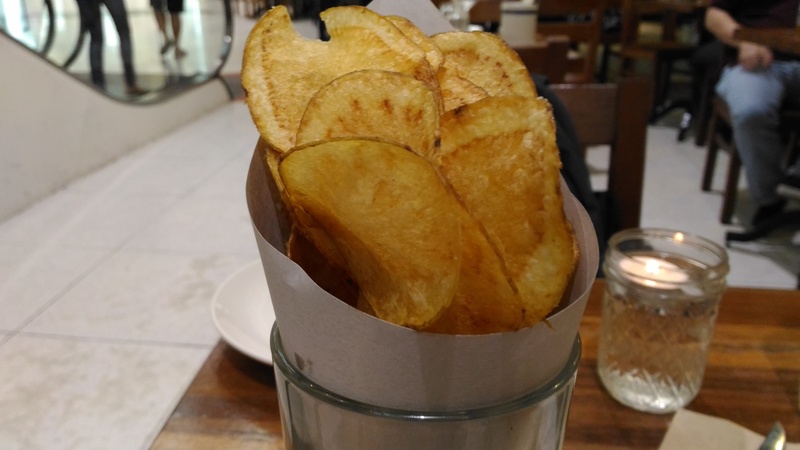 To be fair, each table at Wildflour does get a teeny tiny bowl of salt but I don’t really like to have to add my own salt to my potato chips. Then again, this is probably just me trying to find something wrong with what I ate at Wildflour. 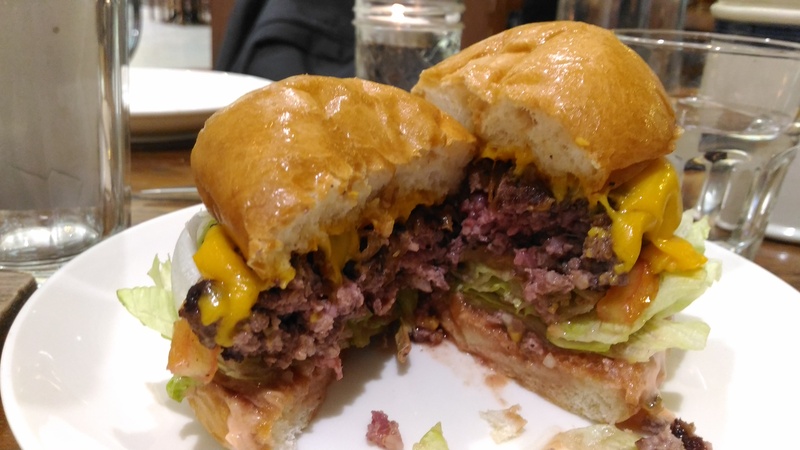 Besides that really minor nitpick about the unsalted potato chips, I do have to say I was incredibly satisfied with Wildflour’s California Burger. It was incredibly good and one of the best burgers I’ve ever had, hands down. It was kind of pricey as it did cost 450 Philippine Pesos (around $10 US) without taxes. But I can think of dumber ways to spend that kind of money. I will say I got my money’s worth. It was worth every penny. 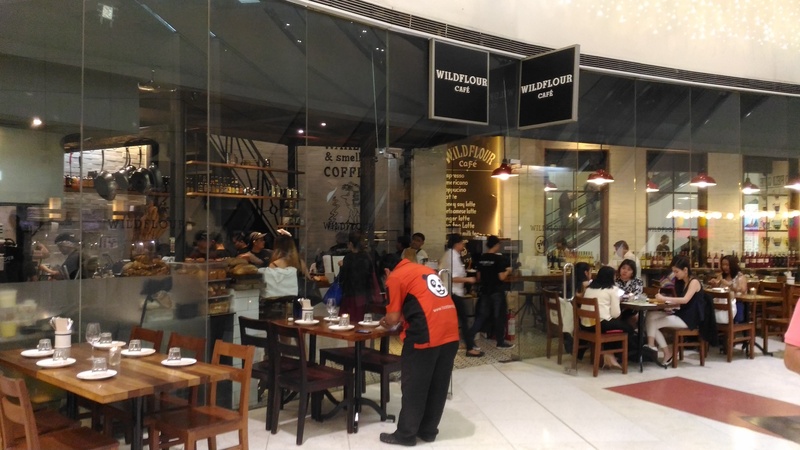 Have you tried eating at Wildflour? What do you think of the place? Leave your thoughts in the comments section below!